This chapter book is targeted for eight to twelve year olds; the easy going storytelling style and charming illustrations interspersed throughout make it visually appealing as well. 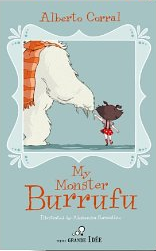 I can’t make up my mind which character I love the most, Olivia, the seven year old mistress of the monster’s house or Burrufu, the melancholy monster. At the beginning of the adventure, Olivia is about to move from the city to a home four hours away in the country. She immediately endears herself to me when I read the note she left to the new tenants asking them to take care of the house and sending them hugs and kisses. Upon arriving at the old three story house, Olivia and her dog Tula begin to explore the home’s nooks and crannies. They hear noises in the attic; her father, Steve, tells her jokingly that maybe it is a monster. Olivia thinks he is making fun of her, and when he assures her that a monster in the house is good luck, she feels relief. Olivia can’t sleep and goes down to the kitchen to have some milk and cookies. To her surprise she spies a furry white claw stealing cookies! So the adventure begins….Olivia is determined to lure the creature out by setting a cookie trap. She discovers that the monster lives in the attic and is a writer like her father. Because Olivia’s dad spends lots of time in his study writing, she has lots of time on her own. Olivia learns that her friend Burrufu can make himself very large when he frightens people; he is fearful of going outside and scaring people. Olivia wants to make him feel wanted and secure so she tries to provide him with courage. One day Burrufu is discovered and chaos ensues. Will Olivia be able to remain friends with her monster, who is really a talented and sensitive writer or will they both be forced to relinquish their friendship due to the fears of others? This book contains approximately one hundred pages and ten short chapters. It can be used as a classroom read aloud or read independently as a chapter book for readers in the middle grades. There is plenty of humor and adventure. The plot contains enough twists and turns plus thought provoking issues to challenge the middle grade reader. Highly recommended. I love the sound of this Barbara.